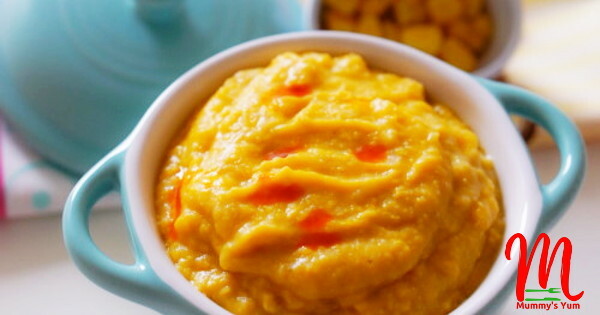 I love the taste of this Beans and Sweetcorn Purée so much because it is not bland like store-bought baby foods. I’m sure it will be enjoyed by babies as one of the introduction to their eating solid food. It is also a good source of carbohydrate, protein and vitamins for the baby. Beans and Sweetcorn Purée is made with peeled beans, so I’ll call it a proper Nigerian baby meal. You can either use the black eyed beans or the brown one and while preparing peeled beans porridge for the whole family, just take out some and make baby’s purée. Peel and wash off the back of beans as you do when making moimoi. Put the beans, chopped garlic and onions in a pot and add about 2 cups of water to cook. Add the fish too if using and boil till beans is soft and has absorbed half of the water. Once softened, add the oil and drained sweetcorn, then stir together and allow to simmer for a minute. Remove from heat and purée in a blender before serving. I hope new mums will enjoy making this for their babies and if you do, don’t forget to share with your other mums. Mummy’s Yum is on Facebook, Instagram, Twitter and Pinterest…get connected. Hi mummys yum. I’ve been following you for my older child but you couldn’t be more helpful,now that I have a baby. Tried most of your pureed recipes here and baby loves them.they are yummy. Good bless you so much for what you have put here free of charge.May your abundance come in due season. I prepared this for my daughter and she loved it. Thanks for all the baby recipes you have here. You are very welcome Chioma. Great feedback. Thank you Mabel, i remember you. How are the triplets doing? Thank you so much.The triplets are doing great and they send their love and kisses for the recipes you share.God bless you. Awww, kisses and hugs to them too. Would like to know from how many months you can start to introduces these recipes to your babies. Zizi, you can start introducing solid food to your baby from 6 months. Some start earlier too, but it is always advised/recommended you consult with your doctor before you commence. They can advise if your baby is ready or not if you are not too sure.